This sudden glut in supply had led to a sharp fall in price. Post that period, the price of Brent crude has risen sharply to $86/bbl in September 2018. Crude oil has traditionally been a roller coaster ride. Between mid-2014 and January 2016, the price of Brent Crude fell from a high of $115/bbl to a low of $26/bbl. This was largely led by a sharp surge in US shale production and things just got worse after Barrack Obama lifted sanctions on Iran in early 2015, which added another 2.5mn barrels of crude officially to the global oil glut. This sudden glut in supply had led to a sharp fall in price. Post that period, the price of Brent crude has risen sharply to $86/bbl in September 2018. However, in the last two months, the price of Brent Crude has fallen by $20/bbl to around $67/bbl. There was obviously resistance at around the four-year high and the price of Brent has slid nearly $20 from the peak. 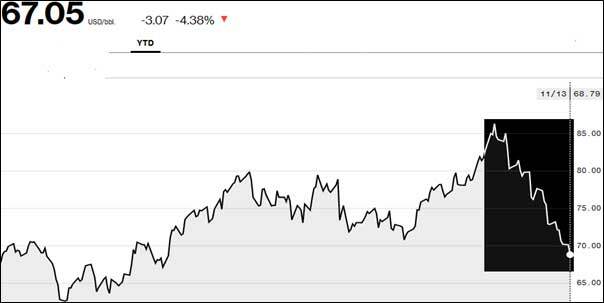 Check the graph below charting the YTD chart of Brent. As can be seen, from the above chart, the price of Brent has fallen by nearly $20 in little over a month. What could be reasons for the recent sharp fall in oil prices? The US shale output has already touched a peak of over 11.5mn bpd and is likely to scale 12mn bpd during this year. With this kind of glut in the market, prices are likely to remain low. The US had asked Russia and OPEC to increase production so as to bring oil prices down and they had complied. However, in the recent OPEC meeting, the OPEC chief has clarified that the OPEC will not only cut production in sync with Russia but will also ensure that the OPEC as an organization sustains. This could give some support. The OPEC output at nearly 32.4mn bpd is already above the peak touched by the OPEC in 2014. The Iranian sanctions were supposed to cut Iran’s contribution to the global oil market by 2.5mn tonnes. However, with the sanctions diluted for 8 major nations including India and China, the move may have little impact on oil prices. Lastly, the reason oil prices did go down was due to fears of a global slowdown. The IMF has already warned that the trade war between the US and China could cut global GDP growth by 30-40 basis points. China is also feeling the strain with GDP growth likely to fall below 6.5%. These concerns also sparked a fall in oil prices. So, what is the outlook for crude oil from here on? If you want to understand the oil issue from the customer perspective, see the number of automobile units sold last month. Consider sales of Maruti Suzuki. The company has been warning about a real impact on sales off-take due to very high oil prices. If that happens, contraction in demand may actually be the reason for a slowdown in demand and fall in prices. Here is how we expect the oil scenario to shape up in the coming year. Trump had started off with his unilateral sanctions on Iran, but after losing the House of Representatives to the Democrats in the mid-term elections, Trump may be a little more cautious. His flexibility in giving exemptions to India, China, and Japan to continue oil imports from Iran was clearly a case of American policy being on the defensive. With India, China, and the EU keen to continue relations with Iran, Trump may have been left with little choice. Will Saudi Arabia and Russia get together again? This is a billion-dollar question. For 18 months between January 2017 and June 2018, the OPEC and Russia sustained their oil output cuts of 1.8mn barrels per day. This not only stabilized prices, but took them to over $80/bbl. If the two key producers, apart from the US, can get together and stitch up an OPEC supply cut formula, this could give an indication of crude oil bottoming out and actually moving higher. OPEC and Russia jointly produce more than 40% of the world’s oil, and hence, are a significant force. The political and economic crises affecting the oil-rich South American country have resulted in its crude production going into freefall. The collapse has tightened oil markets much more quickly than anticipated. The reason Venezuela is important is because it has the largest proven oil reserves in the world. Political and economic strife has taken its toll on the economy. Output is down as Venezuela has cut production even more than Saudi Arabia. The International Energy Agency meanwhile has painted a scary picture. They also expect problems with payment apart from the geopolitical strife. The IMF has already downgraded growth from 3.9% to about 3.7% for the current year and a cut for the next year too. Historically, oil prices have been positively correlated to the level of economic growth. If the trade war is amicably settled and the world economy is able to get back to its original growth, then the sky could be the limit for oil prices. However, sharply higher oil prices could come at a steep cost for India. What happens to India if crude prices fall sharply? The good news from lower oil prices is the lower CPI inflation. This means that the RBI is in a position to adopt a more dovish monetary policy and ensure easy flow of credit as it has been taking the inflation-targeting approach. This also means the impact on the rupee will be largely diminished. What happens to trade deficit? Trade deficit has improved in the last few months as lower oil prices have come as a boon considering India’s 80% dependency on imported oil. Trade deficit is also coming down due to the weaker-than-expected global growth expectations. Check the chart below. A lot could ultimately depend on crude oil prices, although it has normally been in the interests of buyers and sellers of oil to keep it steady at a midway point.